Please start the Network Connections in Windows-10 from Windows 10 control Panel! Optional you can open the Network Connections about Windows-X Menu. In Network Connections please do Right-Click on The WI-FI Network Adapter to disable the WI-FI network connection. See also: ► Commando line to see the WLAN info ► Shortcut to Manage Wireless Networks on Windows-10! 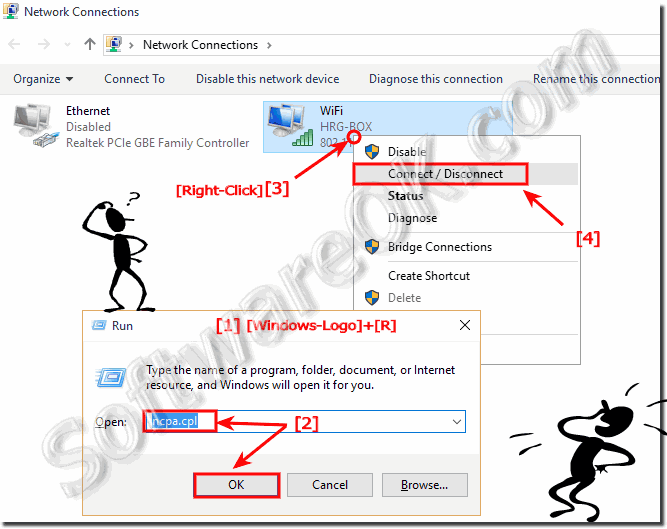 See all Network Adapters / Disconnect ergo Disable the WI-FI (WLAN) on Windows-10! Windows 10 has a large list of Wi-Fi parameters and its features available to the user: View connection data, configure security settings, configure shared access, view file sharing, remote access, and stored passwords. Windows 10 provides the ability to view the password of the network your device is connected to, such as B. to make a Wi-Fi connection with a smartphone or pass a key to a friend. ► Command to see all WLAN information in Windows-10! Public wireless networks are convenient, but if they're not properly secured, connecting to one might be risky. Whenever possible, only connect to wireless networks that require a network security key or have some other form of security, such as a certificate. Hello, I do not have WiFi; maybe it has been disabled. don't know but how can I find it and enable it? Help me connect to the Internet when I connect to the Internet, I can not connect to the Internet? How can I reset the network for Windows 10 Internet problems? I have problems with the network connection under Windows 10? I have problems with my network connection on a Dell laptop with Creators Update on WIN 10 Home 32, what can I do? I am using windows 10 to connect to a wifi, wireless network management where can i manage known networks, and display all networks?